This unsung classic has somehow escaped notice for many years. The climbing is sustained, varied, and occasionally spectacular. 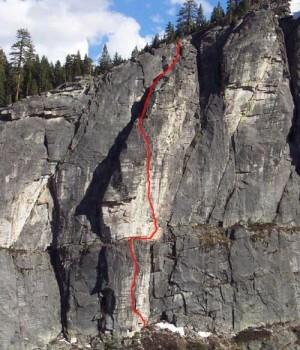 This route has more dikes and face holds than the East Wall and hits you with incredible exposure for the first 300 feet. The climbing mostly involves stemming on large dikes with great protection in nearby cracks. Bring 10-15 slings and plan to use one on just about every piece. Which SuperTopo guidebooks include a topo for Eagle Buttress, Right?